Good Morning & Happy Friday Stamping Friends!!!! 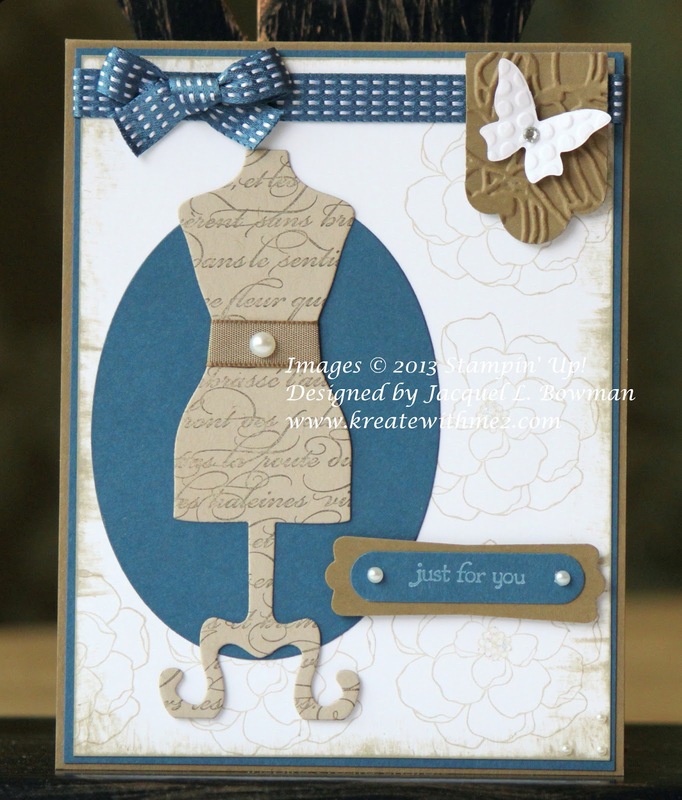 I have a pretty quick post to share....my second card for the dress up framelit swap. I used the pop out from the first card I made along with a pretty unconventional color scheme for a feminine card but I like doing things like that! Back to crafting for me....I do have a LOT more swaps to make!!! great card Jackie. While both cards are pretty, I like this one better than the one posted May 8. Great use blues and browns! Just adorable! Very pretty card! Love the text on the dress form. Very cute! I love the background stamp used on the dress frame lit. Beautiful!!! Blue can be such a great feminine color with the right design and accessories - like here on this card! I LOVE IT!!! The color combination is great. Awesome card. The colours are perfect and I really like the embossed tag. Thanks for playing along with us at Little Red Wagon. I like the classy chic look of your card. And the colour combination. In my opinion blue and brown go together perfectly. Beautiful! Thank you for joining our challenge at Crafty ribbons! Lovely♥. Thanks for joining us at MAWTT this week and good luck♥. Such an elegant card!Love the colors! Thank you for joining our Vintage Milk Coffee Challenge! Great card - love the combination of colours and textures. Your card is so pretty!!! Thanks for participating in our PENNY'S PAPER-CRAFTY challenge!! Hope to see you again next week! This card is gorgeous. I haven't been sure about the dressform dies but I love the way you've used it here.